Vehicles equipped with a drum brake system use brake shoes to stop the vehicle, by creating friction between the brake lining and the inside surface of the brake drum. The brake shoes consist of heat resistant friction material, bonded or riveted to a metal shoe. Hydraulic pressure is applied to the wheel cylinder which forces the brake shoe into the brake drum. Diagnosing and troubleshooting automotive brakes and doing the necessary repairs is a very doable task as brakes are not difficult to understand and most of the components are easily accessible. There are two basic types of drum brake lining arrangements used on vehicles. Servo and dual servo brake systems. Dual servo brakes are a self energizing type of drum brake system, mostly used on older domestic vehicles. The brake shoe arrangement uses a primary shoe and a secondary shoe connected at the bottom, using the automatic brake adjuster screw. The primary shoe uses a smaller amount of lining than the secondary shoe and the material is usually softer. When the brakes are applied, the rotation of the brake drum causes the top of the primary shoe to be pulled forward in the same direction as the brake drum. This causes the primary shoe to apply pressure to the secondary shoe, through the brake adjuster screw. This action is called self energizing since it creates its own force to assist the brake hydraulic system in applying the brakes. Single servo brakes simply use the wheel cylinder alone to force the brake shoes against the drum surface. Both the leading and trailing shoe are usually the same size and manufactured out of the same material. The brake shoes are mounted on a plate that is bolted to the rear axle housing, on rear wheel drive vehicles or to the rear spindles, on front wheel drive vehicles. The mounting plate is referred to as the backing plate. Older model vehicles with four wheel drum brakes will use a backing plate attached to the front spindles, as well. The brake shoes are attached to the backing plate using spring loaded retaining pins. The spring loaded retaining pins are used to allow lateral movement of the brake shoes for brake application. Refer to an appropriate auto repair manual to see diagrams for your particular vehicle. 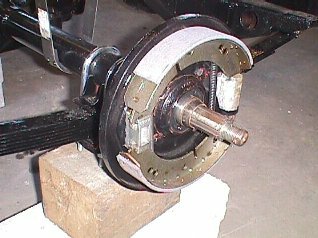 The brake shoes are held in a retracted position by the brake return springs. There are many different configurations of brake return spring arrangements, depending upon the systems design. The brake return springs can be anchored at a central point at the top of the backing plate and attached to the brake shoes. Some vehicle drum brake systems use a single spring to connect the leading brake shoe to the trailing brake shoe. Some systems use a large rigid metal bar as a brake return spring. The bar is bent into a U shape, with the upper ends of the U attaching to the top of the leading and trailing shoe. The brake linings are retained in a closed position by the tension of the metal bar. Contained in the drum brake system hardware, are provisions for automatic adjustment of the clearance between the brake linings and the brake drum. Automatic brake adjuster designs vary widely rom vehicle to vehicle. Most older domestic vehicles use an automatic brake adjustment system that operates when the brakes are applied while in reverse. Most recent designs use an automatic brake adjuster system that operates when the parking brake is applied. Brake drums are used as a friction surface for the brake linings. They are designed to dissipate the heat created by friction to the outside air. Some designs contain external ribs for improved heat transfer. Brake drums are usually constructed of steel or aluminum. The internal friction surface is machined to a smooth surface. Thickness of the friction surface of the brake drum helps to determine the ability of the brake drum to dissipate heat. For this reason, brake drums should never be machined beyond their specified diameter; check the manufacturer’s auto repair book for the machining spec. Wheel cylinders are used to apply force to the brake shoes using hydraulic pressure. They are normally mounted at the top of the backing plate, where they are connected to the brake shoes, either directly or using link pins. Typical designs consist of a single bore cylinder containing two pistons that move in opposite directions when the brakes are applied. The pistons are sealed in the wheel cylinder bore using cup seals. The cup seals are placed on the inboard side of the wheel cylinder piston, with the cup portions of the seals for the opposite pistons facing one another. A spring with conical washers attached at either end, is placed between the wheel cylinder cups. The conical washer is used as a cup expander, to provide a tighter seal for the wheel cylinder cup against the wheel cylinder bore. Not all designs will use a cup expander on the wheel cylinder spring. Some designs of master cylinders use a residual pressure check valve to maintain a slight amount of hydraulic pressure on the rear brake circuit, to prevent wheel cylinder cup leakage. 4 Comments on "Brake Shoes Drums"
What can cause the vibrating and limping of toyota break when it is march?